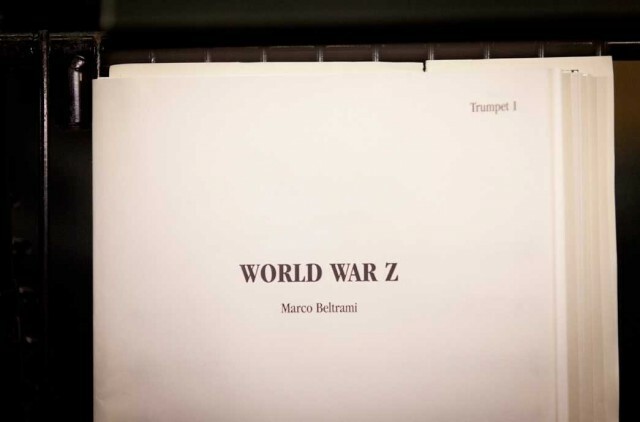 Warner Music release of composer Marco Beltrami’s original music score to the 2013 zombie film World War Z. Release Date: July 16, 2013. World War Z follows United Nations employee Gerry Lane (Brad Pitt) as he traverses the world in a race against time to stop a pandemic that is toppling armies and governments and threatening to decimate humanity itself. The score, composed by Marco Beltrami with additional music by Marcuss Trumpp, was recorded with two ensembles, a full orchestra in Abbey Road and a smaller group at British Grove studios – both in London. Music is conducted by Matt Dunkley. 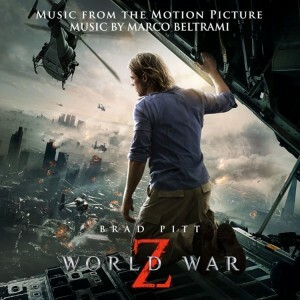 Beltrami delivers an impressive soundtrack that blends both the style of an epic disaster movie and the tone of a zombie horror film to deliver one of his most beautiful, dark, and at times intense film scores. Read an interview with Marco Beltrami discussing the score and see images from the scoring sessions at We Are Movie Geeks. Read a deconstruction of his music together with another interview with the composer at the Hollywood Reporter. This is a definite must-have movie soundtrack.